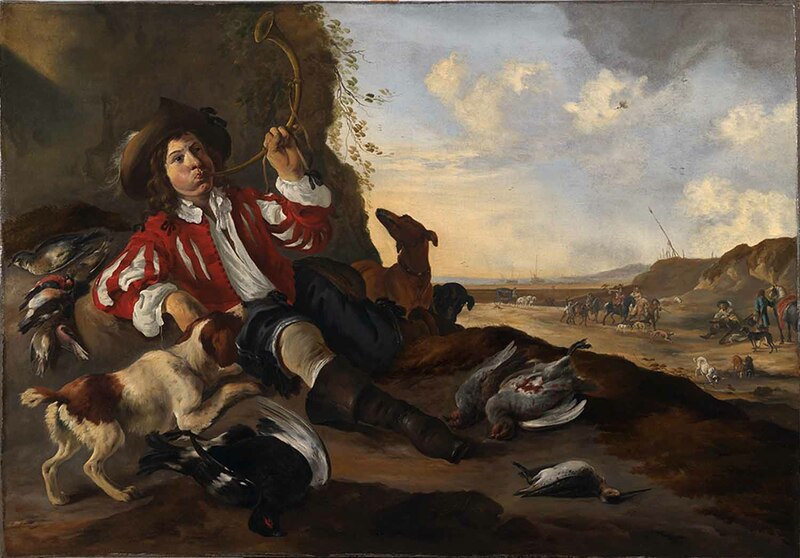 A youthful sportsman reclining on a bank, blowing a salute to the game on his hunting horn, his spaniel by his side with various birds including a brace of English partridge, and a black grouse; a beach with elegant figures on horseback beyond. Oil painting on canvas: 44.9 x 63.8 inches / 108 x 162 cm..
Dirk Stoop was born between 1615 and 1621 in Utrecht, although in many sources, following Waller, his birth year is given as 1610. He was the brother of Maerten Stoop, the painter of battles. His activity as an artist is first recorded in Utrecht between 1633 and 1635; in the latter year he followed many of his contemporary artists in moving to Italy, where he was resident for a decade until 1645. It is likely that he associated with the distinguished Italianate landscape painter Jan Both (d.1652) in Rome at this time: the two artists occasionally collaborated on hunting scenes. Both and Stoop were contemporaries and both were born in Utrecht. His return to Utrecht is likely to have been in 1647, although he seems to have been itinerant, not residing there fully until about1660. In the following year he departed for Portugal., where he was active in the court circles around Catherine of Braganza, following her to London after her marriage to King Charles II in 1662. Stoop stayed in London until 1665, and executed a number of royal portraits, topographical landscapes and hunting genre scenes. By 1667 Stoop was in Hamburg, where he recorded in a dispute with the local painters' gild (under the name of “Rodrigo Stoff”). He settled in Hamburg for fifteen years, only returning to his native Utrecht in 1682. He died there four years later. The present painting is a recent discovery, the artist's signature having been over-painted at some point, probably in the 19th century, presumably for nefarious reasons – that is, to pass it off as the work of the more famous painter Jan Weenix, to whom it was previously attributed. The picture is ambitious within the artist's versatile oeuvre, and shows a thorough knowledge of human and avian figure-painting, as well as a grasp of the dune-landscape which enjoyed a vast popularity in the mid-17th century. It seems highly likely that this is intended as a hunting genre-scene, rather than as a portrait of a sportsman, and that the picture was composed in the studio from previously-executed drawings. The presence of various breeds of birds which inhabit very different habitats (eg the black-grouse is a bird of wild moorland edges, whereas the songbirds are more typical of lowland farmland) make it unlikely that these were the bag of a single day's sport in a single coastal location. It is tempting to suggest that the picture was executed in England, where the black grouse was widespread in the 17th century, but this cannot be a dogmatic assertion since the breed was (and is) occasionally found in the Netherlands and North Germany. Likewise presence of the grey-leg or English partridge would suggest that this is one of the pictures painted in England after the artist's arrival in the train of Catherine of Braganza.